The area was declared a wildlife refuge in the 1930s, and is therefore in the jurisdiction of the U.S. Fish and Wildlife Service. With its location on one of the main migratory routes for waterfowl, the refuge is a good spot to see lots of ducks, seabirds, herons and egrets (about 10,000 snow geese come to visit each year, the refuge says). There’s also a chance of seeing deer, foxes, and maybe even a feral hog. There are several miles’ worth of walking and nature trails, including some boardwalks that go out over the marshes or out onto the dunes. These aren’t strenuous hikes, so they’re suited for people who just want a nice morning’s worth of nature walks. The two main north-south trails, the East Dike and the West Dike, are open to biking, while the four shorter trails are hiking only. Certain areas of the refuge are open to fishing and kayaking. The visitors’ center has a rather nice collection of taxidermy’d animals, including a bald eagle and a red-tailed hawk. Kids will probably enjoy the “please touch” table, with its selection of snakeskins, shells and various animal skulls (deer, fox, etc.). Our walking time was a bit limited, so we did two of the shorter trails: the Bay Trail and the Dune Trail. We started at the trailhead near the visitors’ center building, and followed the trail as it wound through the marshes along the edge of the bay – alternating between a packed gravel path and boardwalks going out over the marshes. 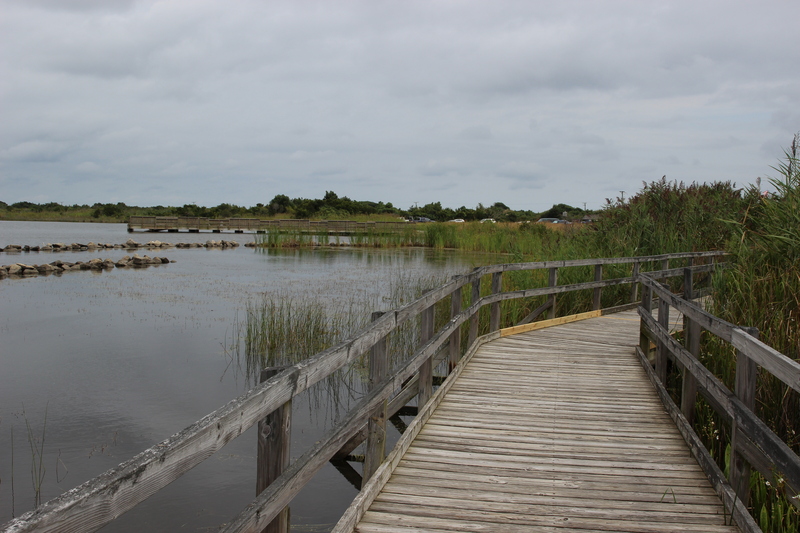 One of the boardwalks includes an outdoor classroom – a deck where school groups meet up for guided tours and outdoor lessons from the refuge staff. The trail doubled around and eventually led us back to the visitors’ center. From there, walked south along the East Dike trail to check out the Dune Trail, which is basically a boardwalk leading out over the dunes to the beach overlooking the ocean. (Please be advised that the beach is closed to swimming and sunbathing and other activities.) Spent a few moments watching the surf – it was a little windy and choppy out on the water that day – and the sandpipers dashing around on the beach. We were about to go farther down the East Dike when we saw a jogger running toward us, frantically swatting at something. When we asked him what was the matter, he said that something was biting him. Poor guy looked pretty agitated about it too.